Social responsibility in action: Make your help last a lifetime! Help us build lives through quality education and skills training. 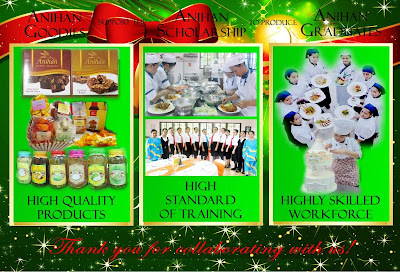 You can help Anihan continue providing full-tuition scholarships to deserving but financially challenged young women by purchasing Anihan Goodies or giving a donation. You can check out the variety of quality baked goodies and pickled products that Anihan graduates and students produce in Anihan's Livelihood Center here. If you wish to make a donation to the Anihan Scholarship Fund, you can be sure it will go a long way in advancing lifelong development for women!